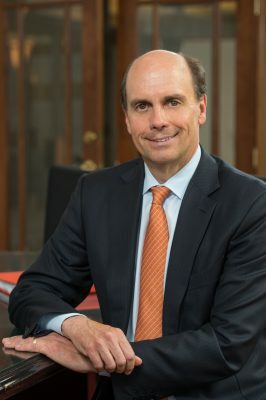 Steve W. Barnes ’82, chairman of Syracuse University’s Board of Trustees, and his wife, Deborah, today pledged support for the Invest Syracuse Initiative, an ambitious fundraising effort aimed at raising $40 million in new student scholarships. The Barnes Family promised an annual fund challenge gift of $500,000 to match new and increased gifts made this fall to grow the University’s commitment to opportunity for promising students. The Invest Syracuse Initiative is part of Invest Syracuse: Advancing Academic Excellence and Student Experience, a $100 million initiative that seeks to redefine the student experience, advance discovery and innovation and expand opportunity, access and affordability. The Barnes Family gift will serve as an annual fund match to generate new and increase current giving among alumni, donors, friends and family. The Invest Syracuse Initiative is focused on enhancing the University’s longtime commitment to access and affordability for hard-working scholars to achieve excellence through a Syracuse education. The Barnes Family is not alone in supporting Opportunity Syracuse. Recently, University Trustee Daniel Mezzalingua ’68 and his wife, Kathy, made a $5.25 million gift in support of undergraduate financial aid and University Trustee John Riley ’61 and his wife, Diane, made a $2.3 million gift to create the H. John and Diane M. Riley Dual Engineering/MBA Endowed Scholarship fund. The Barnes Family has long supported the University—both in service and in philanthropy. Most recently, the family gave $5 million to support the creation of The Barnes Center at The Arch, which will transform Archbold/Flanagan Gymnasium into a holistic health, wellness and recreation complex. In 2010, the Barnes Family endowed the Barnes Family Entrepreneurship Bootcamp for Veterans with Disabilities at the Whitman School. That 2010 gift also created the Barnes Professor of Entrepreneurship at the Whitman School, which is held by J. Michael Haynie, vice chancellor for strategic initiatives and innovation. Barnes is a founding investor in the Orange Value Fund, a $4.1 million student-run portfolio. His family has also provided substantial financial support to the Remembrance Scholarship Fund and to the McLane Legacy Fund, which supports disability initiatives and the Office of Disability Services. Barnes previously served as the co-chairman of the University’s Institute for Veterans and Military Families and is a longtime member of the Whitman School of Management Advisory Council and the Boston Regional Council. Interested in funding opportunity? To make a gift and to learn more about Invest Syracuse: Advancing Academic Excellence and the Student Experience, visit http://InvestSyracuse.syr.edu.